The Old Town is not far from the Central Station. If walking to Archipelago Hostel Old Town it would not be more than 10 minutes. Walk to the right from the main entrance of the Central Station on Vasagatan and cross over Vasabron-bridge to the Old Town. Continue stright on to Stora Nygatan 38. Archipelago Hostel is on the right side of the street. The Old Town is only one stop by Metro from the Central Station. 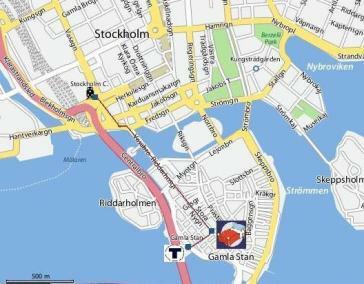 Get off at station "Gamla Stan" and walk only two blocks to Archipelago Hostel on Stora Nygatan 38. The Airport Coaches will bring you from Skavsta Airport to Stockholm City Terminal and the Central Station in app 1 hour. You may walk or continue by Metro from the terminal. 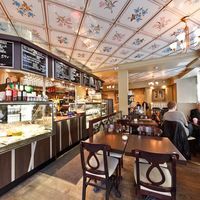 The Airport Coaches or the Arlanda Express Train will bring you from Arlanda Airport to Stockholm City Terminal and the Central Station in app 30 minutes. You may walk or continue by Metro from the terminal.